King Kurog, alternatively known as Kurog gro-Orsinium and Kurog gro-Bagrakh, is the King of Wrothgar and rules from Orsinium. He only rules in theory in northern Wrothgar, which is a patchwork of Strongholds, but he does control southern Wrothgar. Kurog is a controversial ruler, as he joined the Daggerfall Covenant—comprised primarily of Redguard and Breton states, which had antagonized the Orcs for centuries. Moreover, Kurog publicly insists that his people worship Trinimac rather than the Daedric Prince Malacath, which fails to convince many other Covenant citizens and makes him unpopular with his people. Kurog possesses several unique animations. The only other NPCs to utilize them are the Orsimer Soldier followers who take his place at Frostbreak Fortress. 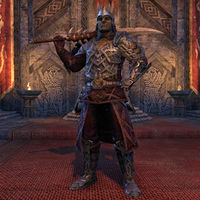 King Kurog's voice actor is JB Blanc (IMDb), who had previously played Bosmer characters in Elder Scrolls Online. This page was last modified on 24 March 2019, at 00:18.